We are here to serve others with compassion and comfort by relieving suffering and restoring dignity to those living with a life-limiting disease. Providing care and compassion that feels deeply personal to each individual is what distinguishes us from other organizations. Patient by patient and family by family, this is how we choose to make a difference to others. In 2018 we cared for nearly 800 patients, either in their own homes, or in other facilities throughout the local communities in the Roaring Fork, Colorado, Crystal, and Eagle River Valleys. HomeCare & Hospice of the Valley offers services that prevent and relieve suffering, restore dignity and comfort those living with a life-limiting disease. We base our care on compassion, comfort as we recognize and honor the dignity of each person. We serve patients and their families who reside in any of the local communities in the Roaring Fork, Colorado, Crystal, and Eagle River Valleys. Known as “Our Community’s Hospice,” we are a non-profit organization, governed by a Board of Directors who live and work in communities throughout our service area. Start-up funding for HomeCare & Hospice of the Valley came from Aspen Valley Hospital, the Aspen Valley Medical Foundation, and Valley View Hospital who formed Hospice of the Valley in 2008. 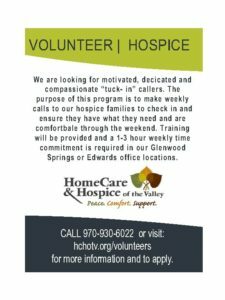 In December 2009, Vail Valley Medical Center requested that Hospice of the Valley assume ownership of the 20-year-old Mountain Hospice program. *We believe that every life is sacred and that every individual in the last stage of life should die with dignity. *We believe everyone deserves to know and understand available options for end-of-life care. *We believe people of all ages deserve to have their grief honored and their lives celebrated. *We believe no one should live in pain. *We believe no one should die feeling alone. We base our care on compassion and comfort as we recognize and honor the dignity of each person. To us, our clients are more than patients; they are our friends, family, and neighbors. To ensure quality care from trained health care professionals, we provide our staff with continuous, specialized training that goes beyond the state-mandated requirements.